This seminal collection of sonatas is a cornerstone of the chamber literature and prime training ground for all future virtuosi. Written over the course of about 15 years, from 1797 to 1812, these complete sonatas for violin and piano show assured compositional mastery throughout. Eleven CDs include the complete performance of each sonata featuring virtuoso Mario Hossen, with additional tracks minus the soloist that allow you to play along with master pianist Sung-Suk Kang. Also included in this deluxe set are slow-tempo accompaniments to aid in the learning of each sonata. This collection is vital to the developing violinist and it contains a wealth of material to provide a lifetime of enjoyment. Sonatas include: Violin Sonata, No. 1 in D Major, Op. 12, No. 1 · Violin Sonata, No. 2 in A Major, Op. 12, No. 2 · Violin Sonata, No. 3 in E flat Major, Op. 12, No. 3 · Violin Sonata, No. 4 in A Minor, Op. 23 · Violin Sonata, No. 5 in F Major, Op. 24 (Spring) · Violin Sonata, No. 6 in A Major, Op. 30, No. 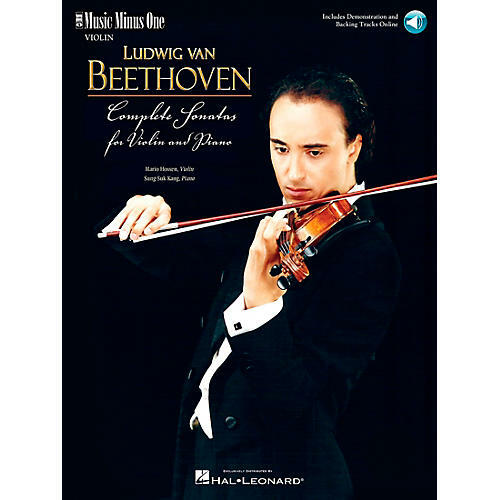 1 · Violin Sonata, No. 7 in C Minor, Op. 30, No. 2 · Violin Sonata, No. 8 in G Major, Op. 30, No. 3 · Violin Sonata, No. 9 in A Major, Op. 47 (Kreutzer) · Violin Sonata, No. 10 in G Major, Op. 96.